Community Church of Boston has affordable, comfortable function space for rent, for daily, evening, weekend, weekly, or longer-term rentals. We have a space for all occasions – events, classes, meetings, reunions, films, galleries, book fairs, craft shows, theater rehearsals/performances, etc. We rent to businesses, individuals and nonprofit organizations, and provide discounts to grassroots groups requesting church co-sponsorship. 1) Fill out an online rental application HERE. 2) We will get back to you with any questions, to confirm availability, and to arrange a tour if desired. 3) If it works, you put down a $25 deposit (taken from the total fee) to hold the space. You also sign a rental agreement form. 4) The total balance is due by the date of the event. The Community Church of Boston is an historic 5-story brick building located at 565 Boylston Street in Copley Square. Our church has one floor of rental space available. Lothrop Auditorium is a hardwood-floor, 1,200 square-foot space on the 2nd floor of the building, accessible by elevator or stair. It has a picture window overlooking Copley Square and can accommodate up to 125 individuals (seated auditorium-style) or 65 individuals (seated at tables). There are two “step-up” bathrooms in the Lothrop Auditorium (not wheelchair accessible) and a wheelchair accessible bathroom on the third floor. A PA/sound system, folding seats and other amenities are available for use. The Lothrop Auditorium is air-conditioned. A $25.00 deposit is required upon submission of the rental application. The deposit will be returned if the rental application is denied. The deposit will be held and applied to the rental fee if the request is approved. In the event of cancellation, the deposit fee will be returned only if cancellation occurs with 72 hours advance notice. Standard Rate is for businesses and individuals. Co-Sponsor Rate is for groups, events and organizations that are supported by Community Church of Boston. This rate requires a vote of the congregation’s Board of Directors, and listing the church as a co-sponsor in all publicity materials. For weekend, weekly, monthly or long-term rental rates, please contact the church. In addition to the rental rates listed above, there is a Custodial Fee of $50 for all events in the Lothrop Auditorium that require clean-up. Kitchen Facilities. Full cooking/kitchen facilities are located on the 4th floor. Tables and Chairs. We have three large banquet-style round tables that seat eight individuals each or be used for buffet serving, and various rectangular tables. We have approximately 100 folding chairs. Tables and chairs are available free of charge. Coat racks. We have two moveable coat racks available free of charge. PA/Sound system. We have a powered mixer, speakers on stands, and microphones on stands. There will be a small fee to use this equipment. Groups wishing to use the sound system/PA must stipulate this in their rental agreement, and the church must approve. Grand Piano: Rental of our piano is available by special request. Video projector and movie/slide screen. We have a video projector for VHS videos or DVDs. There will be a small fee charged to use this equipment. Groups wishing to use the video projector/screen must stipulate this in their rental agreement, and the church must approve. * The use and cost of any of the above items must be stipulated in the rental contract. Pre-payment policy – Individuals and groups renting the Lothrop Auditorium must pre-pay in full before using the space . There can be no exceptions. The $25 deposit must be received in advance as stipulated above. Full payment for the space must be received on or before the event date or the space will not be available for use. Thank you for your cooperation. 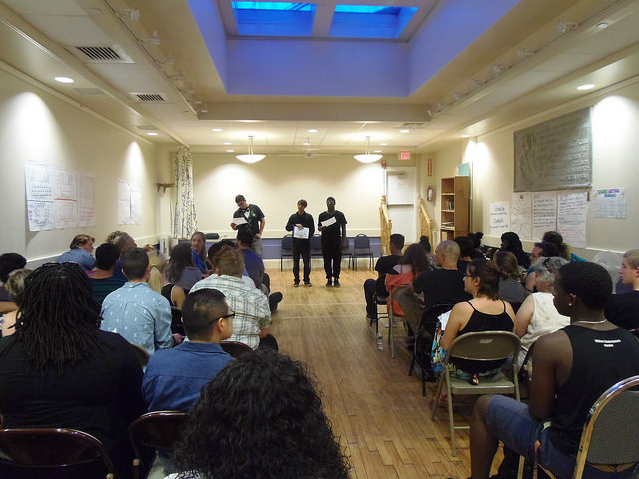 Through co-sponsorship of an event or organization, the Community Church of Boston supports groups, projects and organizations that align with our social justice purpose and mission. Co-sponsorship requires approval from the church’s Board of Directors. Co-sponsorship provides groups with a discounted rental rate, and the church asks that it be listed as a co-sponsor in a group’s publicity materials. Groups must request co-sponsorship on their rental application. The church is minutes from public transportation: we are a 2-minute walk from the Orange Line (Back Bay) and the Green Line (Copley) station. We are located across from several bus lines in Copley Square. On-street metered parking is very limited in this busy neighborhood. Garage parking is two blocks away.